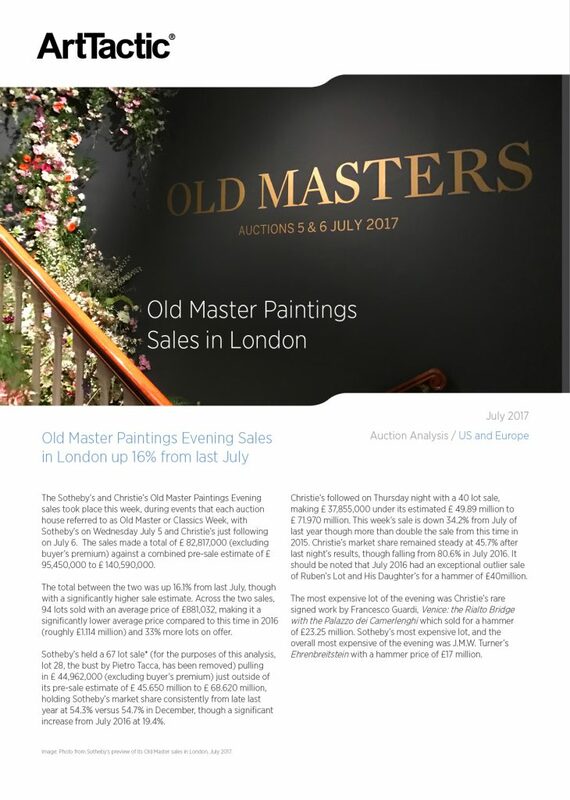 The Sotheby’s and Christie’s Old Master Paintings Evening sales took place this week, during events that each auction house referred to as Old Master or Classics Week, with Sotheby’s on Wednesday July 5 and Christie’s just following on July 6. The sales made a total of £ 82,817,000 (excluding buyer’s premium) against a combined pre-sale estimate of £95,450,000 to £140,590,000. The total between the two was up 16.1% from last July, though with a significantly higher sale estimate. Across the two sales, 94 lots sold with an average price of £881,032, making it a lower average price compared to this time in 2016 (roughly £1.114 million) and 33% more lots on offer. Comparative Performance (Christie’s and Sotheby’s). Total sales vs estimate (2010 – 2017). Average prices 2010 – 2017. Guardi & Turner highlight profiles with Top 5 Auction Results.